The Basic edition of the kit is an affordable option that provides you with a starter marketing kit that includes 36 different pdf printable marketing pieces to use in your grooming salon, the printable marketing planner, the 2019 printable Groomer's Appointment Book and 2 marketing secrets Ebooks. Plus BONUS of the first six months of the 2020 printable Groomer's Appointment Book. 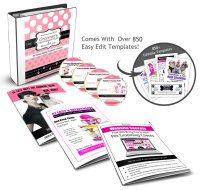 The Advanced edition of the Kit includes everything from the Basic kit PLUS over 850 editable templates , 3 Ebooks, four social media cheat sheets and is available as either an instant digital download or as 4 CD's, with 2 binders and 3 booklets. Download is available immediately upon purchase. Download link is also automatically delivered to your email. One time purchase. No recurring charges. Product details: 1 printed B&W 2019 appointment book in 3-ring binder, 1 printed B&W 2019 marketing planner in 3-ring binder, 4 CD's and 3 booklets. Kit arrives within 7-10 business days via US Priority Mail. Shipping is available within the U.S only.